Lately, I’ve been relying on the weekly to-do list printables to help me stay sane as I navigate my way through the process of setting up a new planning system. Between the growing craziness of home, family, and work life areas, I’m struggling to stay on top of everything. The weekly to-do lists have been a great resource to have on hand, some weeks acting as my weekly planner and others just to use in tandem with my planner as I get the new system up and running one step at a time. 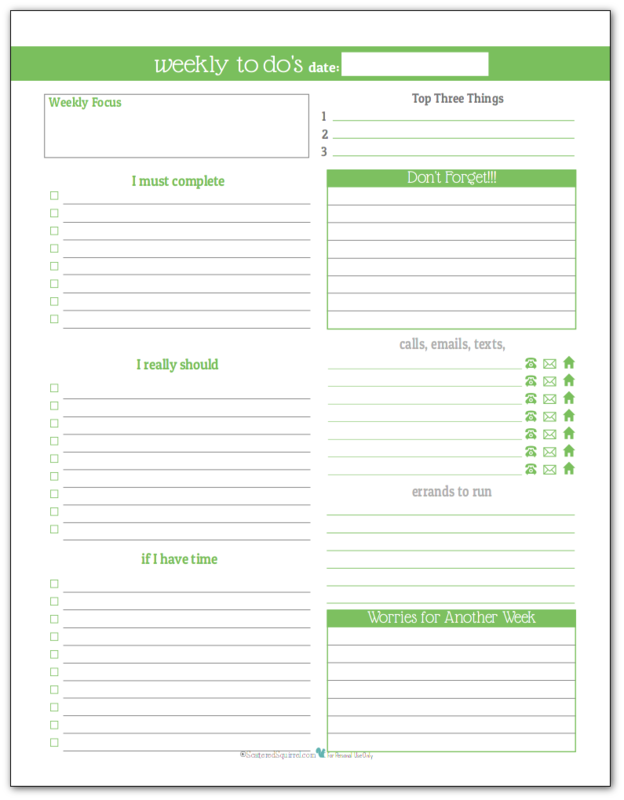 Whether you’re changing everything around like I am, or are just looking for something to help you stay on track, these printables are a great way to keep track of all you need to do on those busier weeks. Which is great for peace of mind, knowing everything is there and you don’t have to worry about forgetting something. The weekly to-do list printables first appeared as part of the 31 Days 31 Printables series. I use one of these each week and I’ve found that a weekly to-do list has become an integral part of my planning process. You can use these in place of a weekly planner or you can use them in conjunction with a planner. I know I found these super helpful when I was using a daily planner because it gave me a place to keep track of all those weekly to-do items. 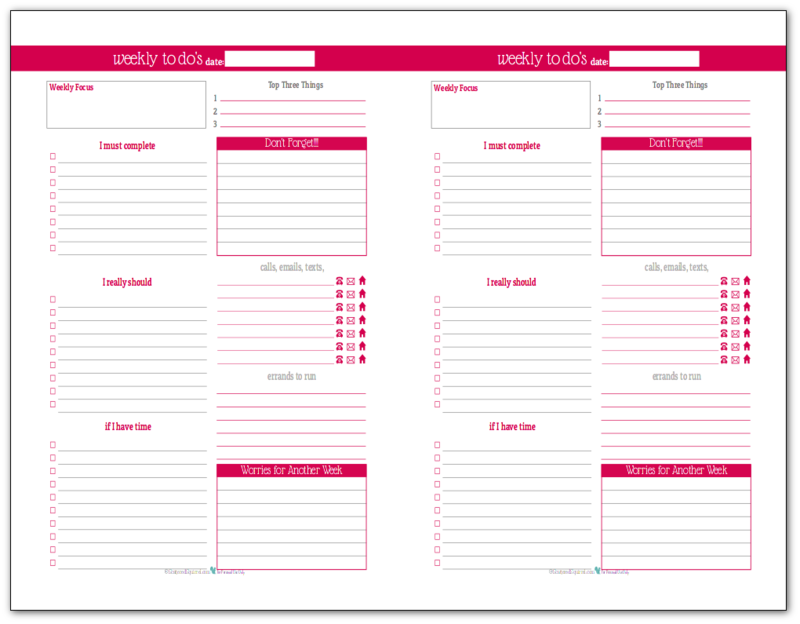 Just like with the daily to-do list planners, I updated the weeklies to reflect the new colours and fonts. I also updated the top areas to include a weekly focus section, which I’m finding has been really helpful for me when it comes to making plans for the week. If my focus is family fun time, I’ll be more inclined to put off non-essential, non-family activities until another week, because I know I want to focus on family stuff that week. I’m not going to explain the printable again since it really is exactly the same as the daily ones with the exception of the titles Weekly Focus and Worried for Another Week. If you’d like to see a full explanation of all the different sections hop on over to the post, Stay on Track in 2016 With These Daily To-Do List Planner Printables, and you’ll find the descriptions under the photo of the blush coloured daily to-do list. I use weekly to-do list printables to help keep me on track when I plan out my week. I usually start filling out a new one on Friday evenings. By the end of the day Friday I have a good idea of what we’re going on the weekend, and whether or not I’ll be able to finish everything left on my list. I move over what needs to be moved over, and over the course of the weekend, I’ll add in what I know needs to get done the following week. On Monday morning, I pick my focus for the week and decide what things are going on my list of Top Three. If I know that I have stuff coming up next week, I’ll grab a blank one and start filling it out as needed. The nice thing about using this outside of my normal planner is that once I’ve transferred everything to the appropriate place I can hang it on the fridge so it acts as a reminder for me. Just like the daily to-do list planners, these ones come in six different colours match the 2016 dated calendars, use them all or just your favourite colours. As always, to snag a copy of the printable or printables you’d like, just click the pic (or pics) to get a copy of your own. You knew these were coming right? I’ll give you a brief summary here. Each one features two weeks per page and print on regular letter size paper, in a landscape orientation. After printing just cut in half down the middle and away you go. Just like above, click the pic (or pics). I hope you enjoy the new weekly to-do list planner printables and that you find them a useful tool for staying sane during those busy weeks. With spring break right around the corner, I have a feeling these might come in very handy for us. I’m thinking that I might print one per person per week, during the school break and use just the left side to assign chores and reminders about homework stuff like reading. We’ll see, though, that might be a little overkill. 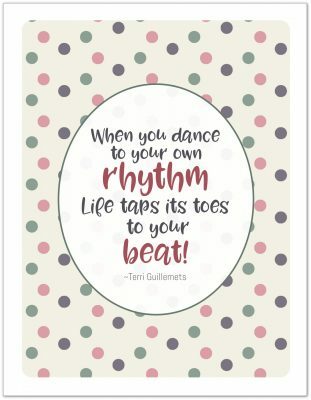 What do you think of the weekly to-do list printables? Do you think you’ll find them useful? I didn’t even know I needed this until I saw this, but now I totally need it. I love my weekly planner in my Happy Planner, but it *really* bugs me that there isn’t really anywhere to make lists for the week. I’ve tried using the top sections across for the list for the week, and moved it to the middle sections for this week, but it’s still so messy and it makes me a bit flittery in regards to wanting to cross off everything for that day, even though it’s really not things that need to be done on that day (and then I want to make arrows showing which direction (either before or after that day) for when things actually got done) and it’s just…a lot of stuff everywhere. This, though, would be easy enough to print out and stick in (and punch on both sides of the page so it could face the current day no matter which part of the week it’s on). Love the “worries for another week” box. It is so good to write those down so you can get them off your mind! Super great idea! I love these!! I def need to print these out for my planner.. Thank you so much.. you are so generous and creative.. These are AWESOME!!! I just found all your beautiful calendars and printables via Pinterest. I’m putting together my own planner and these are awesome!! Thank you so much for putting these out there! I’m planner obsessed 🙂 I love the design of your planners and the way you have the to-dos organized by priority is perfect. Thanks! I’m thrilled to hear that you like the planners, I hope you find some that will be useful for you. These colors are so pretty! I need to redo my planner. Thanks for sharing with the Get It Together link party! Thanks so much Krystal! And thanks for hosting such a fantastic party! Yes, please do a video of different planners! It’s in the works Beth. I recently had to switch up some of my planners so I’m working on getting them all set up and then I’ll for sure do a video or two about them. Thank you for your website full of wisdom and inspiration! I am actually a scattered squirrel who is far from recovery! I spin my wheels…2 steps forward then 2 steps back. I love this weekly layout design. Would you have the same design for a daily layout? I tend to get distracted by visual stimulus and this design would be ideal!! Thank you so much for your kind words. 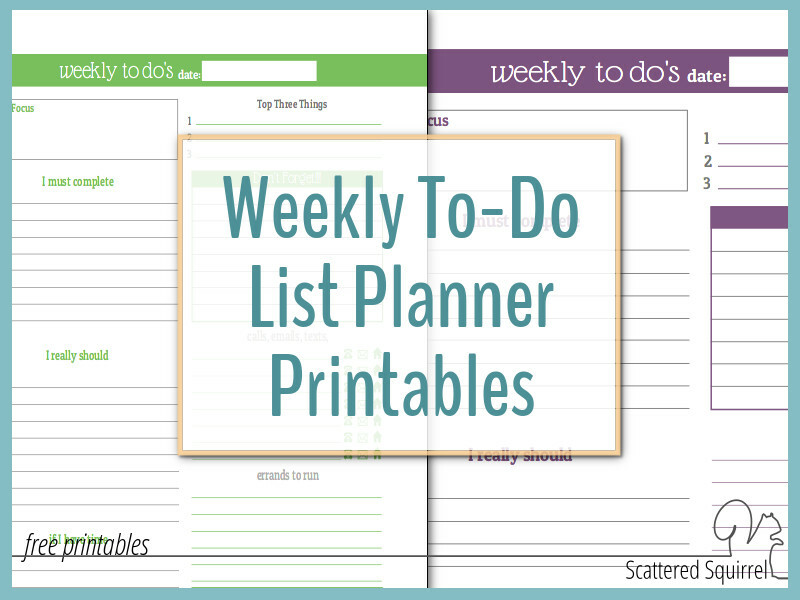 I hope that you find some printables to help you with your planning needs.